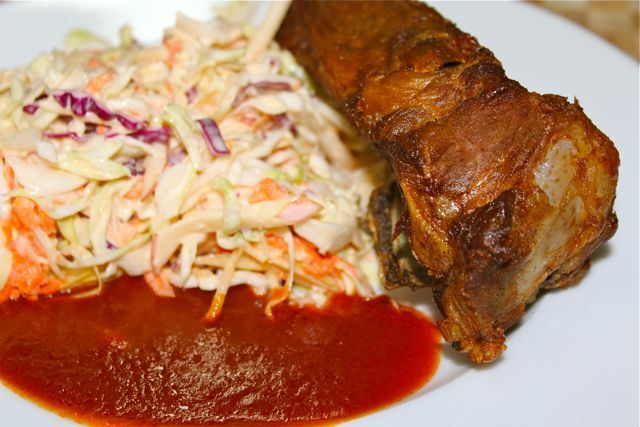 We also made a quick coleslaw salad (thinking we were going the barbecue ribs route earlier) that was a nice side dish to the ribs. 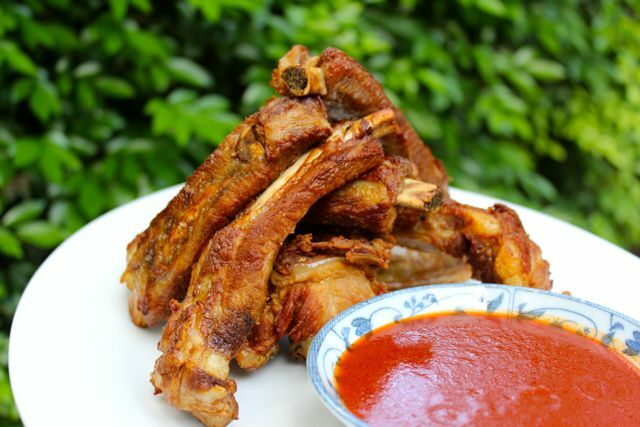 So the next time you are at the grocery/butcher and buy some boneless liempo, think about buying a whole liempo (belly) with ribs attached, and perhaps ask the butcher to remove the ribs for you… take the ribs home and either make a pork rib sinigang, another rib use favorite, or these really easy fried pork ribs! oh my..yes! we found a mexican hot sauce already flavored with lime juice -it’s delicious and it’s called La Guacamaya, and it will be perfect with this! What a delicious looking impromptu lunch! 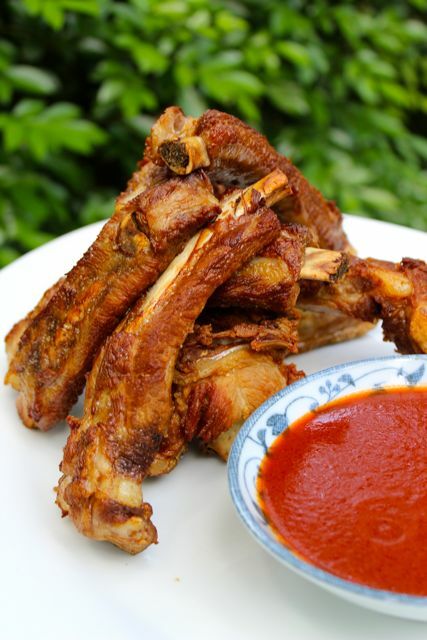 I love marinating ribs with the usual Pinoy not so secret spices and my favorite sambal and par boil it for few minutes before frying or grilling them. My dear Nanay enjoy the soft meat. Didn’t even read the article, just saw the title & picture. Lard, king of fat! The best cooking oil along with coconut oil. Lots of saturated fat beneficial to the brain. Lucky you! I buy only kuro buta here but when I try to make lard it has a different smell so I end up not using it. I wonder if I needed to boil the fat first? Very timely. SAL N’ pepper ribs. Must be good pulutan with a bottle of Corona. MM, was trolling through the archives this morning and saw your recipe for deep-fried salt and pepper squid (very timely, Lee!) and that’s what we had for dinner tonight. followed the suggestion of some readers to add some 5-spice powder to the flour mixture, served the dish with some large steamed asparagus and some bagna cauda to dip them in, and we had a nice “celebration” dinner. i agree with lee, it would have been perfect with corona beer. Pork a-hoi!!! I have two racks in the freezer. I also bought some Angus beef cutlets and only need a good, okay hot, temperature for a barbecue/al fresco dinner. Bring on the Corona! Oh! They’re a favorite in my family … for sinigang, inihaw, or quick-fry. Siding would be atcharang papaya or Salted egg salad. Must try them with coleslaw as well. Thanks, MM! This is another must-try dish. I can imagine dipping these babies in pinakurat. i should really not read your column right before lunch. Wow..the pork ribs look very yummy. nakakagutom naman! Oh, I’m getting sooooo hungry! But here is as good a place as any to pose this question: Do you re-use oil or lard you’ve used in deep-frying? If you strain it, what do you use to strain it? What we call “cheesecloth” here in the USA? And how do you store it between uses? How many times would you re-use it? And here’s my big question – how do you dispose of the used oil/waste? If you are here in the USA, say in NYC, how would you dispose of it? I tried to sk this question at “casa Veneracion” site(?) – and I got my head chewed off! 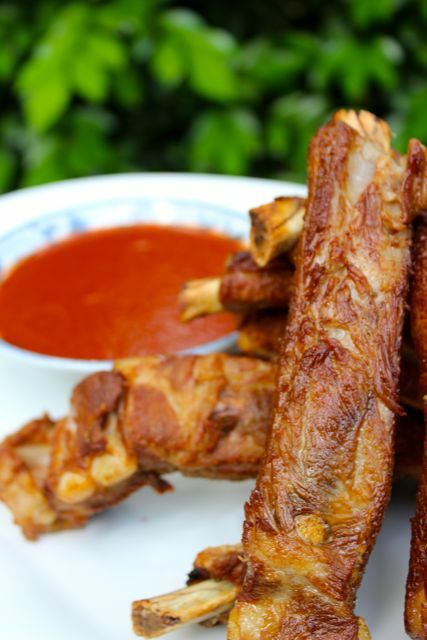 PS – I’m making your pork tocino recipe – no salitre – & does not require deep frying! A family favorite! Thanks! PPS – do you have a recipe for crispy/spicy salt & pepper whole shrimp? That’s what I used deep frying technique for!